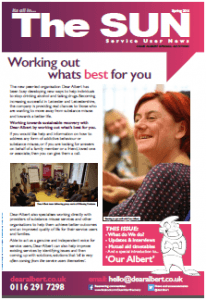 A big welcome to our first ever edition of your Service User News. This is a new recovery publication packed full of information about drug and alcohol treatment, how we can help, mutual aid meetings including AA, NA, SMART and Act Peer Recovery and loads more besides. We are also proud to be launching ‘Our Albert’. Our Albert is a new character designed to reach out and communicate with those still struggling, but not yet getting the help they need in order to ‘get well and stay well’. Simon, part of the Dear Albert design team, says ‘We all know an Albert, someone who is using drink and drugs excessively, but not yet able to see for themselves the trouble they are getting into by abusing substances. It’s like the proverbial loveable rouge, before all the loveable bits get kind of rubbed away, leaving friends, families and services, etc., to help put the broken pieces back together. Why wait until the consequences of a prolonged using career become so horrific? We say, stop now’. Particularly designed to appeal to younger people, Our Albert is all about getting the penny to drop, and to bring the whole recovery process forward so that years and years of a life are not wasted in ‘active addition’. Dear Albert Director Jon Roberts adds ‘Most people with a drink or drug problem are not even in treatment. The whole concept of getting help is alien to them, almost laughable. The problem is this is not funny. If we can reach people at an earlier stage and encourage them to get the help they are going to need in order to successfully resolve and their substance misuse problem, then a great deal of harm and heartache is avoided. Sadly for some, in some instances, Treatment services are perceived as unapproachable, even toxic. Our Albert is about saying ‘look, we can clearly see where your behaviour is taking you, even if you not looking at the end game yet. Let’s sit down and have a look at this. Not in a patronising ‘we know best’ sort of a manner, but on a peer to peer chatting level. This approach works’.